Sports technologies are part of the growing global sports and recreation industry. In the world of high-performance sport, prominent sports stars and elite coaches are increasingly tapping into the world of technology and innovation to advance performance. Innovations in technology are applied across all areas of sports science, sports medicine, sports surgery, sports rehabilitation and sports coaching to enhance elite sports performance. In many ways, the emerging era of the ‘technology-driven sport space’ is changing both the way that we practice and the way we connect with sports. It follows on from her earlier work presented at the ASTN Queensland Conference recently. Ringuet-Riot, Caroline, and Daniel A. James. “Innovating to grow sport: The wider context of innovation in sport.” PROCEEDINGS OF ASTN1 (1), 2013 1.1 (2013): 40. Innovation is nothing new to sport, but represents everything that is ‘new’ and can facilitate a competitive advantage. Broadly defined, innovation is the introduction of a new idea or behaviour in the form of a technology, product, service, structure, system or process on to the market [1,2]. Innovation is different to invention. It moves beyond the discovery of a new idea to solve a problem and instead focuses on the market introduction of that invention to end-users or consumers . In the sport context, innovations that are solutions to a pre-identified problem or need are critical to developing sport and for maximising the experiences and performances of individuals and organisations. This paper argues that future innovation in sport should focus more on identifying individual and organisation needs for technology and management innovations (i.e., performance gap) to better facilitate enhanced sport experiences and performances at all levels. Advances in sport technology are part of the growing global sports and recreation industry. At the individual level, technology innovation is changing the way that we practice and connect with sport. For instance, innovative uses of technology can help spread expert knowledge about best practice coaching through IPads and Smartphone apps thereby addressing the needs of recreational sport participants for more interactive experiences. Further, media and information technologies (e.g., high speed and infrared cameras) address the entertainment needs of the viewing public and provide vital information to coaches and officials. sports coaching and is integral to athlete development and performance. For instance, wireless tracking and wearable sensors provide quality feedback for performance analysis and monitoring, and enhance training and competition outcomes. Similarly, at the organisational level of sport, technology innovation is commonly acknowledged as a source of competitive advantage. Technology is used to grow consumer interest and increase funding for sport (e.g., through improved sport coverage and broadcasting), improve sport quality (e.g., through adjudication and officiating), regulate sport (e.g., through doping detection), and improve access to sport experiences (e.g., through advances in sport safety). Yet, management innovation in sport is also gathering momentum. Management innovation refers to the introduction of new practices, processes, techniques or organizational structures that are “more systemic and difficult to imitate than technological innovations” and can therefore provide a distinct competitive advantage. 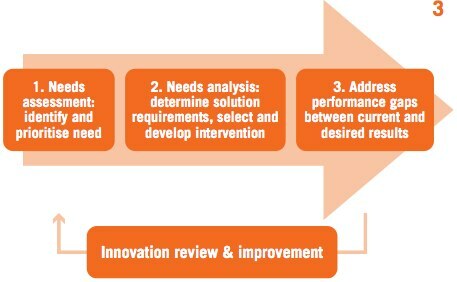 Management innovations are an important source of value creation and underpin the leadership and performance frameworks of successful sport organisations. For instance, organisations that adopt new practices and processes can enhance the efficiency and effectiveness of their operations and address performance gaps. In many cases, technology may act as an enabler of management innovations. Yet, anecdotal evidence suggests that approaches to identify a technology or management need are often adhoc and not well structured. That is, innovative ‘solutions’ are often developed before a problem has been identified;; commonly referred to as ‘solutions in search of a problem’. Innovations that address pre-identified needs have a greater capacity to grow sport. We suggest that sport can effectively address performance gaps and create competitive advantage by conducting need assessments. Future innovation in sport should focus more on identifying individual and organisation needs for technology and management innovations to enhance sport experiences and performances at all levels. Thank you for this post. I really enjoyed reading it. You make two interesting statements, the first about the risk of implementing technology which is really a ‘solutions in search of a problem’; the second about ‘Innovation is a source of competitive advantage to sport organisations’. While I do agree with both statements I think there is an element of contradiction. Using technology to collect data even when you’re not quite sure how that data can be used exactly is step 1, the next is to analyse the data over time and try and gain new insights in order to get a competitive advantage. This is exactly what has been done with sabermetrics- when the data was first collected there was no problem that had been formulated that needed answering. I work for a company that provides hyper precise positioning and sensor technology for sports and I have a background in business analysis in technology. I have found that it’s the companies that are willing to invest in getting new data analysis are also the ones that get the most out of it in the long run.